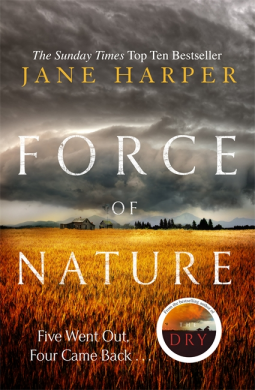 I was delighted when Kimberley from Little, Brown Book Group UK asked me to be part of the blog tour for the hardback release of Force of Nature by Jane Harper. I’ve never been on a team building exercise like this one in Force of Nature – thank goodness! This one for employees of an accountancy firm, BaileyTennants is a really bad one – two groups, five men and five women with no experience of hiking are sent out into the outback, on their own, for a few days. The only training they were given was a half-day course in navigation for one member of each team. And they weren’t allowed to take their phones with them. Inevitably the worst happened – the women’s group got lost and when they eventually returned one person, Alice Russell, was missing. Once I had got over my disbelief that such a terrible team building exercise would actually happen, this is fiction after all, I found that I loved this book, set in the fictional Giralang Ranges in Australia, seeing the Mirror Falls roaring down from a cliff edge into the pool fifteen metres below, the eucalyptus trees and the dense bush, and the breathtaking views of rolling hills and valleys as the gum trees give way, with the sun hanging low in the distance. In fact I soon became completely absorbed in the mystery of what happened to Alice. The narrative moves between two different time periods that gradually merge into one. The descriptions of both the locations and the characters are wholly convincing – it was as though I was there in the bush, with the women struggling to get back on course and find their way back to the rendezvous point. I could feel their frustration and fear of the elements and whatever danger was out there in the bush, as their food and water ran out and they struggled desperately to survive. Their relationships, not good at the start, rapidly deteriorate as underlying jealousies and resentments come out into the open and results in violence. Equally convincing is the search party, with Federal Agent Aaron Falk and his colleague Carmen Cooper from the financial investigation unit in Melbourne. They were involved in the search because Alice, the missing woman, was a whistle blower, helping them to uncover an elaborate money-laundering scheme run by BaileyTennants, the company that employs her and the other women. It’s as much a character study as it is a mystery. Alice is a very unpopular person and any one of the other women could have been responsible for her disappearance. The tension and suspense is carried through to the end – an end that I thought I’d worked out, but of course I hadn’t got it right. This is the second of Jane Harper’s Aaron Falk’s novels. The first is The Dry, which I haven’t read yet. So I was pleased to find that Force of Nature works very well as a standalone book. There are a few references to what I think must have happened in The Dry, but nothing that gave away the plot of that book. I’ll definitely read The Dry as soon as possible now. My thanks to the publishers and NetGalley for my review copy. Jane Harper is the author of The Dry, winner of various awards including the 2015 Victorian Premier’s Literary Award for an Unpublished Manuscript, the 2017 Indie Award Book of the Year and the 2017 Australian Book Industry Awards Book of the Year Award. Rights have been sold in 27 territories worldwide, and film rights optioned to Reese Witherspoon and Bruna Papandrea. Jane worked as a print journalist for thirteen years both in Australia and the UK and lives in Melbourne. Force of Nature is Jane’s second novel. Janeharper.com.au. So glad you enjoyed this as much as you did, Margaret. I’ve been hearing a lot of good things about it, and it sounds like the sort of story you get caught up in as it goes. I have read several good reviews of this book. Have to read it. It takes my thoughts to “Picnic at Hanging Rock”.